Busy Panel Baby Quilt Finished....Thanks for the suggestions! Thread: Busy Panel Baby Quilt Finished....Thanks for the suggestions! Hi everyone! I posted a while back asking for help on how to quilt this and what color thread to use and got lots of great ideas. Here is the finished quilt, although my pic makes it look longer and skinnier than it is! Per the suggestions, I used orange thread (except on the border) and outlined the blocks and the animals and things inside them. Since it was free motion, my stitch length varied widely! On the border I used matching blue thread and used the serpentine stitch. It was so quick and easy and I loved the way it turned out. I'll be using it again. Anyway, just wanted to post the finished quilt and thank you all again ! Oh, someone had asked for the info on the panel but its several years old and I've already thrown away the selvedges and don't remember who made it. Very cute and so well done. That is a darling quilt! Sure to be a childhood favorite. I love the quilting on the boarder. You did a great job! Asking a seamstress to mend is like asking Picasso to paint your garage. It's really cute. Love the way you framed it in stripes, then gave it a restful blue border, and more delightful stripe on the binding. Thanks everyone! You are all very kind! This is such a wonderful board! ​Cute quilt and the serpentine stitch is a great way to add texture to a quilt! Excellent work! That panel is so cute. I've been learning to FMQ, and my stitch length varies widely too, but as they say, finished is better than perfect! Great panel quilt!. I really like the techniques you used to embellish it. I know it will be well loved and a child will grow up with those sweet animals. Thank you for remembering to show us the finished quilt. Adorable and guaranteed to be a baby’s favorite! Ooooh! That is nice! I really like how you used color with this panel. Cute quilt...I find that panels can be wonky to work with but yours looks great! Nice use of the serpentine stitch. Love that stitch. Very petty..love colors too. Quilting beautiful..
Well done! I sometimes think panels look like, well panels but you have made this one look like it is all pieced with the great quilting. Your quilt turned out really cute. Thanks for sharing. You've done a great job of making this your own. 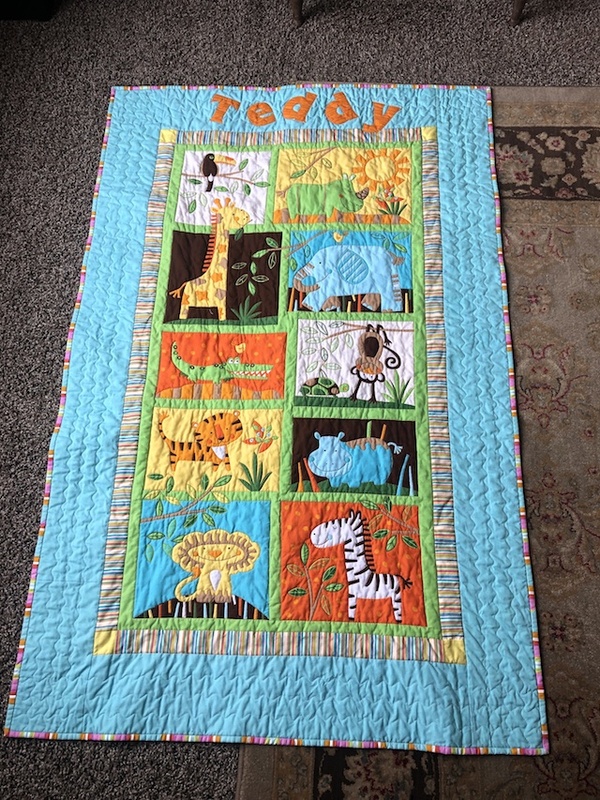 Love the color and quilting you used for your border - it brings everything together. That really turned out great!